Do you remember getting told off at school for passing notes in class? 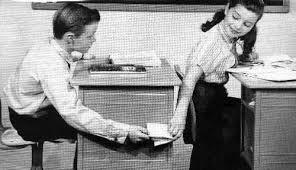 That age-old teenage tradition that is now rapidly being replaced by its 21st Century counterpart: under-the-desk texting? It is often said that the greatest lessons are those where the pupils ask more questions than the teacher. Quite simply each pupil must write down one question they would like answered about the topic onto a piece of paper and then fold it as if it is a secret note. As soon as they are ready, you stick some music on. The pupils all pass their notes clockwise around the class (it doesn’t really matter if they get muddled) until you stop the music. When the music stops, each pupil must open up whatever note they are holding. Pupils read the question that they are holding and must then go and research the question and produce an answer for it. A shorter version of this activity is achieved by asking pupils to write down a question about the topic that requires a quick, concise, factual answer. In this way, when the notes have been passed, pupils can be called upon to read out the questions that they are holding and attempt to answer them then and there! This activity is simple but really effective: it involves every pupil in the classroom – so there are no passengers. It encourages pupils to ask questions, it facilitates independent research skills, and it allows you to identify areas of the topic that still require clarification. Best of all, it’s fun, it’s intriguing and it’s designed specifically to close gaps in the pupils’ knowledge.